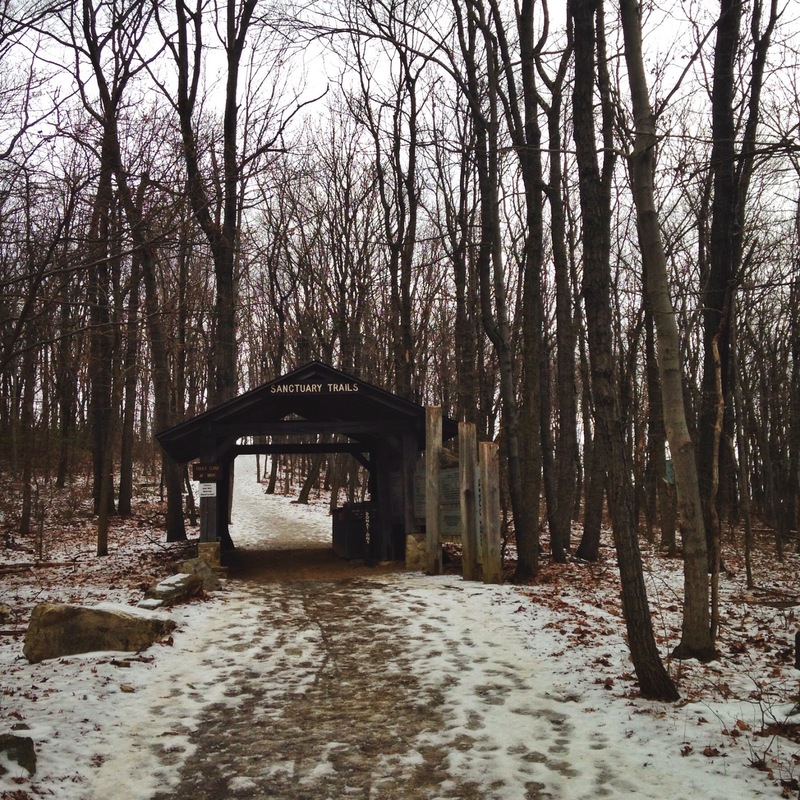 Entering Hawk Mountain Sanctuary, trails covered in ice and snow. One of my favorite things about winter hiking is, more often than not, trails that are crowded during the hiking high season are almost entirely deserted. The forest is quieter, familiar terrain becomes slightly unfamiliar, and everything looks completely different. I've been to Hawk Mountain more times than I can count in the summer, but up until this trip, never in winter. 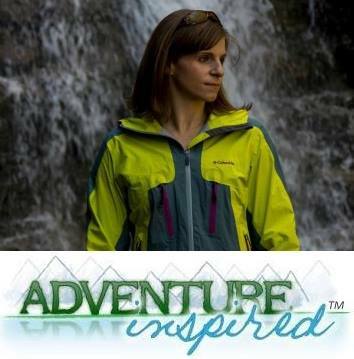 It's one of my favorite hiking spots because the trails are challenging, it's perfect for a quick afternoon getaway if you're Philadelphia-based like I am, and the sanctuary's mission to conserve birds of prey worldwide is near and dear to my heart. After stopping in at the visitor center to pay the trail fee, we took a few minutes to chat with visitor center staff about trail conditions. It's $6 for non-members to visit the sanctuary, but it's free for members. (As of February 9th, I'm officially a member!) There was snow on the ground, but a warm spell and a day of rain had us concerned that our planned loop would be completely covered in ice, and impassable without YakTrax or MicroSpikes. We decided to proceed with caution and turn around if conditions deteriorated on parts of the trail I knew required rock hopping. After heading out of the ice-covered parking lot, which was all but deserted given the temperature and trail conditions, we opted to take a loop I've done before. It's my favorite way to see as much of the sanctuary as possible. Treading very, very carefully on the outskirts of the River of Rocks. After passing through the entrance gate, we walked uphill toward the intersection of the Lookout and River of Rocks Trails, then turned right to follow the River of Rocks Trail. The trail descends 600 vertical feet down loose, rocky terrain, stone steps, and over large boulders through beautiful, quiet wooded areas and rhododendron stands. It quickly became obvious that we'd be contending with snow and ice on the majority of the hike; we slowed our pace, took our time, and stepped wisely. Half an hour later, we found ourselves at the River of Rocks, the trail's namesake and one of my favorite destinations in the sanctuary. The mile-long River of Rocks formed during the last Ice Age as a result of repeated freeze-thaw cycles. Water seeped into cracks in the rocks, froze, and expanded, breaking the solid Tuscarora sandstone into boulders. Over time, the boulders slid downhill, and now, the 300-400 foot wide River of Rocks sits beneath the lookout trails at Hawk Mountain as a relic of ancient climates. 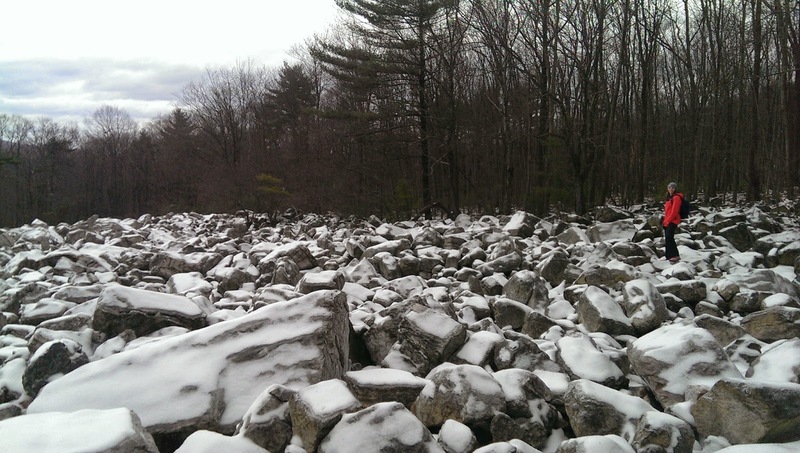 Hikers can access a similarly fascinating boulder field at Hickory Run State Park. Read more about area geology here. The intersection between the Golden Eagle and Skyiline Trail. After boulder hopping and exploring, we kept moving along the red blazed River of Rocks trail until we came to an intersection with the yellow blazed Golden Eagle Trail. Hikers can choose to turn left at the first intersection, which we did, or extend the hike by following the red blazes around the entire River of Rocks and making a right when the River of Rocks Trail intersects the Golden Eagle Trail again. The Golden Eagle Trail gave us some reprieve from the ice-covered boulders as we made our way up the 600 feet we'd descended on the River of Rocks Trail in less than a mile. The Golden Eagle Trail is wide, easy to follow, and doesn't require as much boulder hopping or careful stepping as the River of Rocks or Skyline Trails. We ran into a group of three other hikers who'd done the loop in the opposite direction, and they let us know the Skyline Trail was slippery, but passable if you took your time. After turning on to the Skyline Trail, we picked our way along the boulder-covered Kitatinny Ridge. Though the boulders were all but covered in ice, patches of snow gave us enough traction to move without slipping and easier sections of trail made the going less challenging. The blue blazes painted on the rocks helped us stay on track, and I found myself grateful they weren't completely covered in snow. We arrived at the terminus of the Skyline Trail, the North Lookout, after a mile of slow, careful steps. The entire 4-5 mile loop took us approximately three hours. It was a beautiful hike, and I really enjoyed being able to see the area in a new season. Along the blue blazed Skyline Trail. This is my, "Next time, we're bringing YakTrax!" face. However, I definitely don't recommend traversing steep, jagged rocks and ridgelines covered in ice without some sort of traction device, and the next time I visit Hawk Mountain in the winter, you can bet I'm bringing my YakTrax! 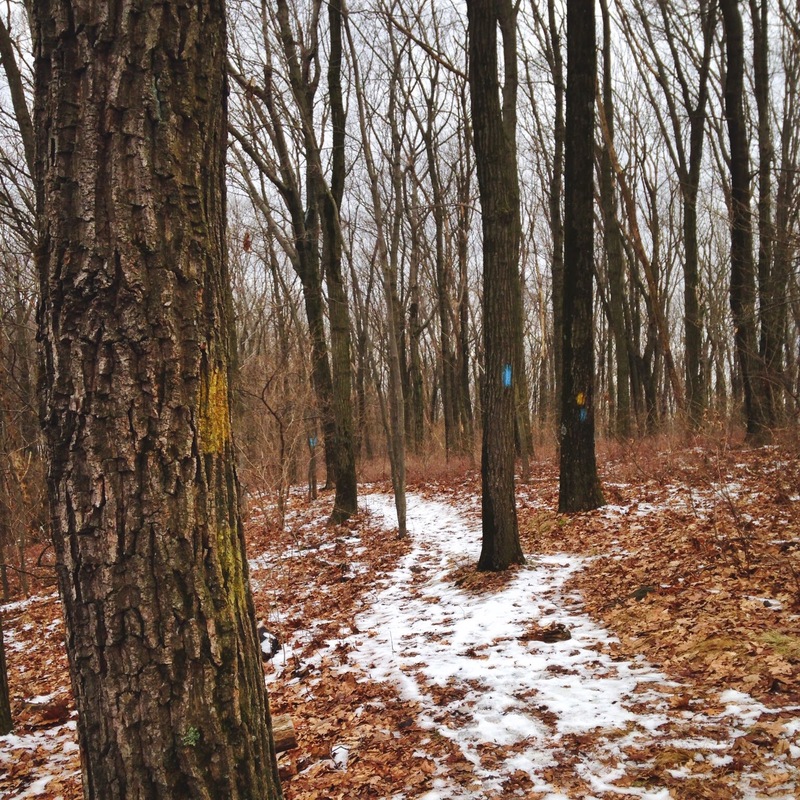 Have you been on some of your favorite local hikes in different seasons? What's your favorite season to get out and explore? 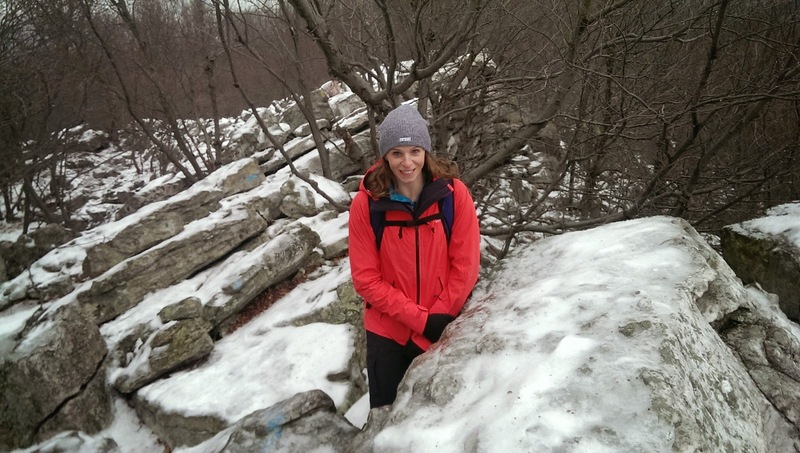 Have you been to Hawk Mountain in the winter? I'd love to hear from you! Have been to Hawk Mtn. in warm weather. Thanks for inspiring me to visit this winter!